When I wrote about the author Isaac Asimov, I confessed he is my favourite author, and the one who introduced me to science fiction. Before I go on to talk about other authors from the Golden Age of science fiction, I want to introduce you to his most famous works – or should that be work, because in later life he bound them all together in one series. The first book is I, Robot (1950), a collection of nine previously published short stories woven together as a 21st-century interview with robopsychologist Dr. Susan Calvin. The next four robot novels The Caves of Steel (1953), The Naked Sun (1955), The Robots of Dawn (1983), and Robots and Empire (1985) make up the Elijah Baley series, and are mysteries starring the Terran Elijah Baley and his humaniform robot partner, R. Daneel Olivaw. They are set thousands of years after the short stories, and focus on the conflicts between Spacers — descendants of human settlers from other planets, and the people from an overcrowded Earth, who mostly live underground. Mirror Image, one of the short stories from The Complete Robot anthology, is also set in this time period (between The Naked Sun and The Robots of Dawn), and features both Baley and Olivaw. Another short story, Mother Earth, is set about a thousand years before the robot novels, when the Spacer worlds chose to become separated from Earth. 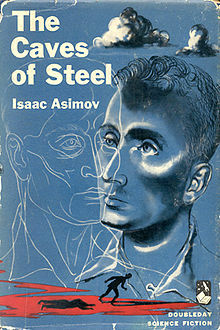 The Caves of Steel and The Naked Sun are both considered classics of the genre, but the later novels were also well received, with The Robots of Dawn nominated for both the Hugo and Locus Awards in 1984, and Robots and Empire shortlisted for the Locus Award for Best Science Fiction Novel in 1986. The Galactic Empire series (also called the Empire novels or trilogy) is a science fiction sequence of three of Isaac Asimov's earliest novels, and extended by one short story. They are connected by their early place in his published works and chronological placement within his overarching Foundation Universe, set around the rise of Asimov's Galactic Empire, between the Robot and Foundation series to which they were linked in Asimov's later novels. 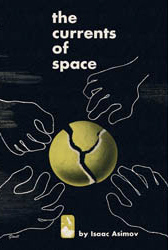 The Foundation series is a science fiction series of books which is the core of Asimov’s Galatic Empire stories. For nearly thirty years, the series was a trilogy: Foundation, Foundation and Empire, Second Foundation. It won the one-time Hugo Award for "Best All-Time Series" in 1966. 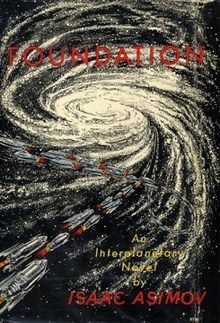 Asimov began adding to the series in 1981, with two sequels: Foundation's Edge, Foundation and Earth, and two prequels: Prelude to Foundation, Forward the Foundation. The additions made reference to events in Asimov's Robot and Galactic Empire series, indicating that they were also set in the same fictional universe.